The wolves had pierced all four tires by the time our old Corolla had reached the base of the hill. I squeezed my baby close to my chest while he screamed bloody murder. I had originally fretted over bringing him on an afternoon drive because I thought the incoming storm might startle him. Less than an hour before, I had been terrified by merely the danger posed by slick roads and thunder in the distance. The wolves started as a group of three. They had emerged from the thicket that sprawled on either side of the country road and started slowly trotting behind the car. At the outset, the show was rather amusing. I had spent the first eighteen years of my life growing up in a little cabin out in the woods and I had never once seen a wolf. Only from the warm comforts of my bed would I occasionally hear them howl or discover their paw prints in the mud the next day. Rarely do the nocturnal species show themselves. Certainly not before the sun sets and in a group of nine or ten trying to break savagely inside a moving car. Torrential rain poured onto the windshield. The droplets hit the glass like bullets and smothered the surface, clouding our view of the grey and black beasts all around us. Thunder rumbled from the expanse of dull fog behind us. The approaching storm wasn’t far behind. The metal of the exposed tire rims screeched against the concrete while we started to make our way uphill. Dad pressed down on the gas with all his weight and slowly we began our ascent. A wolf jumped and ripped off the passenger door window with its front paws. It shook the remains between its fangs from side to side before tossing it away. I squeezed Ian tightly against my chest again in recoil. His high pitched scream temporarily drowned out all the snarling outside. It didn’t matter what the documented behaviour of the species was. It wasn’t going to do us any good. The car started to shake when we reached the quarter point of the hill. We wavered to either side as the metal groaned beneath us. The wolves worked away at the rear bumper and door handles. One jumped on top of the car and the patter of its paws of the roof drifted into the car. More thunder sounded in the distance, closer than it did before. I prayed that the oncoming storm would make them scramble for shelter in the safety of the trees. It was a wish that was never granted. That nightmare was supposed to be a pleasant afternoon drive into town. Dad was going to take his daughter and infant grandson in to do some shopping before the storm caught up to us. It was the same hilly road that he would drive me to school on every weekday growing up. I found it so important to have Ian come along on the same drive his mother used to take as a little girl. I wished so much I would have just left him at home with his dad. Better yet, I wished we had never left the city for the weekend in the first place. We were passed the halfway point of the hill. The wolves grew more desperate. Two more had joined the one top of the roof and they were starting to jump up and down as if they meant to collapse the ceiling. The others on the ground were launching themselves against the windows, each time looking closer to shattering them altogether. Dad pressed and held the horn. Ian wailed in misery in response to the foreign sound. It forced a few of the wolves who paced in front of the car a couple steps, but no further. More wolves were howling and rallying themselves in the distance. They kept spilling out of the trees and joining the pack which must have become twenty or more by that point. One of the larger ones, with blackened fur and scarred shoulders, threw itself against my window so hard the whole thing cracked and barely stayed in place. It would only take one more collision like that for it to breach. I did as he instructed. We were on the last stretch towards the top of and I thought the floor was literally going to fall from underneath me when I stepped through the front seats and landed in the back. More thunder sounded. The rain kept pouring down. One of the wolves on top of the car bit and ripped off the wiper blades scraping wildly in front of us. Our already poor vision was only made worse by the endless flow of water streaming over the windshield. The bigger next to the passenger door jumped again and managed to break one of its paws through the glass. Blood and water dripped onto the seat after it pulled back. We had nearly reached the summit. The wolves snarled and bared their fangs more fiercely while they continued their onslaught of the vehicle. There were so many of them by that point there wasn’t enough space. They jumped over each other and fought for position trying to make contact with the car. “Hold on,” dad said while he adjusted his seatbelt. The engine groaned while he kept pushing all his weight down on the gas. We passed the flat stretch before the road started declining again. The momentum of the car picked up and we accelerated in the direction of the town. The wolves were able to continue their assault in the beginning, but couldn’t keep up once we picked up enough speed. The car shook wildly and bounced up like we hit a speed bump after we ran over one of them unable to get out of the way. We had separated ourselves from the pack. Out the back window, they continued their pursuit, running top speed downhill and slipping while their claws struggled to keep traction with the soaked concrete. Our way downhill was remained relatively smooth while our trajectory remained straight. The uncontrollable rattling started when we began our inevitable drifting to the right. Dad tried to steer back to the left but we were helpless and at the mercy of the slick surface beneath us. We drifted further towards the edge of the road. The snarling wolves and closing thunder behind us sounded like it was catching up again while dad pumped the breaks trying to regain control. It was of no use. We were on course for an inevitable crash into the shallow ditch that shouldered the road. All three of us screamed so loud that the sounds couldn’t be distinguished from one another. I held Ian so tightly that I thought I was going to crush him. Time stood still for a moment as the damaged and demented tire rims left the concrete and met the open air above the ditch. I felt vertigo like on a roller coaster drop as we crashed to the bottom. I bounced so high in the seat my head would have cracked against the roof had the seatbelt not been holding me down. Ian almost sprung from my arms and I only managed to keep a grip on him by catching his shirt with edges of my fingers. Dad winced and rubbed the part of his forehead that had slammed into the steering wheel. Momentarily, we were in a fortunate position. Our momentum hadn’t been enough to launch ourselves into the wall of trees a little further over. Had that been the case, we wouldn’t have even been alive to deal with the pack of wolves that was once again upon us in the car’s final resting place. We had become truly easy-pickings. They were all around and on top of us. Every window was shattered and on the brink of caving in. “I’m sorry for this, Colleen” dad said and started rummaging through the mess of papers in the glove compartment. He pulled out his old Springfield Pistol. The same gun he promised me would never be within one hundred feet of me or his grandchild at any point during our visit. Even right then, when it was our last feeble attempt to protect ourselves from the countless wolves outside, he was embarrassed to bring it out. Whatever feeling existed between us at that moment, passed. He took action quickly. “Cover Ian’s ears,” he said. He rolled down his window just a crack, slowly inching down bit-by-bit, just enough so he could poke the muzzle out. He fired one shot that ripped through the air and pierced my unprotected ears. The shot hadn’t been much more effective than the horn. 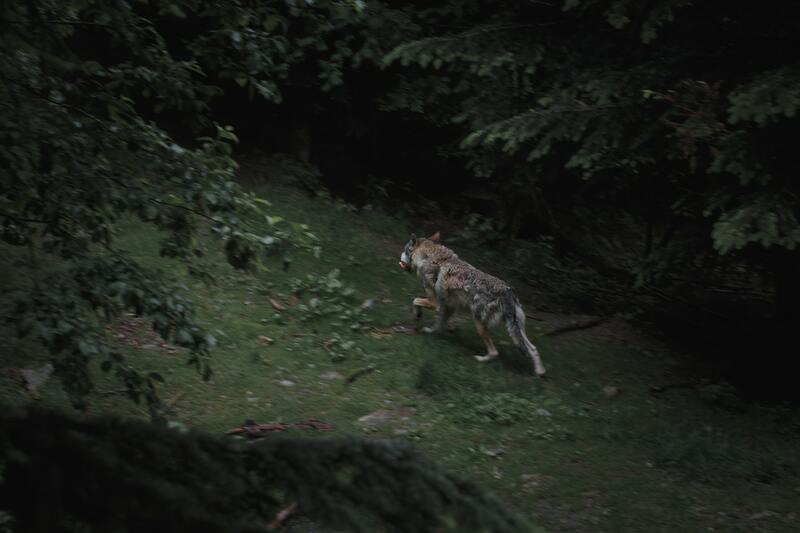 One wolf was hit in its hind leg and squealed in pain when it reeled back. The others were undeterred. One jumped ahead of the pack and into the vacated space. It jammed its paws in the space between the window and the roof and started prying it downwards. Dad tried to spin the gun in its direction. He fired a shot and missed. He fired again, but by the time the bullet connected with the side of the wolf’s head, enough of its work had already been done. The space was big enough that three more had jumped up and stuck their paws inside the car. Dad tried pulling the gun outside the window but dropped it when one of them sunk their fangs into his wrists. He fell back clutching his arm. I slid to the back-right seat as it the minimal distance I had moved was going to help. It didn’t take the others long to pull the window all the way down. One of the slender ones jumped up and managed to wriggle its way inside. It crawled right over my dad who punched its gut with blood running through his fingers. It did not retaliate. It simply curled up and lay down on the floor at the base of the passenger seat. Dad shot up and looked like he was ready to fight it tooth and nail. The wolf still didn’t acknowledge him, it just lay there with its head down, whimpering like a saddened suburban mutt. A larger one jumped up and got stuck in the narrow opening. Its coarse fur was like a blanket, smothering the space and blocking the light coming from the driver window. I closed my eyes and waited for the sound of it ripping into my wounded father. This one also made no attempt to attack. It desperately tried to wriggle its way inside. Its feet kicked against the door and scratched the paint as the other wolves jumped into its back, impatiently awaiting their turn for entry. The thunder rumbled so loudly and shook the ground outside that I thought the lightning struck the road directly behind us. The wolves heads all turned back uphill in unison. They quickly lost interest in breaking into the car. They scattered and ran in circles before rallying and sprinting down the road towards town. The larger one, which had itself partly wedged inside, decided better and scraped its way back out. It stumbled on the road and sprinted after the group. The one wolf left with us made still made no attempt to jump up or attack. It continued to lie there calmly. It closed its eyes and put its paws over its face. The thunder sounded again. This time there was no mistaking that the Earth had shaken along with it. I looked out the back window and stared into the grey fog. Through the waves of rain crashing down, it was amazing how soothing the scene was without the howling and surrounding wolves. The thunder sounded one more time. Something dark in the distance emerged. Its massive frame lumbered down the road towards us. The deep sound continued and the ground shook with every step. There were four thick legs that bent awkwardly like trees growing out over the edge of a river bank. Its exterior was covered mostly by a smooth white exoskeleton with scattered patches of black hair. Its head towered way above us. It hung from an arched neck just below the tops of the trees. Two dark holes were evenly spaced on either side of its face. It kept trudging towards us. The ground was vibrating more all the time. I looked back to my father, who was wide-eyed and staring at it as well. Our new pet wolf kept whimpering from the front of the car. The thing was right above us. It pushed the car effortlessly with one of its legs and moved us closer to the trees. It appeared the wolves hadn’t been trying to get inside the car to hurt us. They were trying to save themselves.